So I was out shooting in the fog last December. 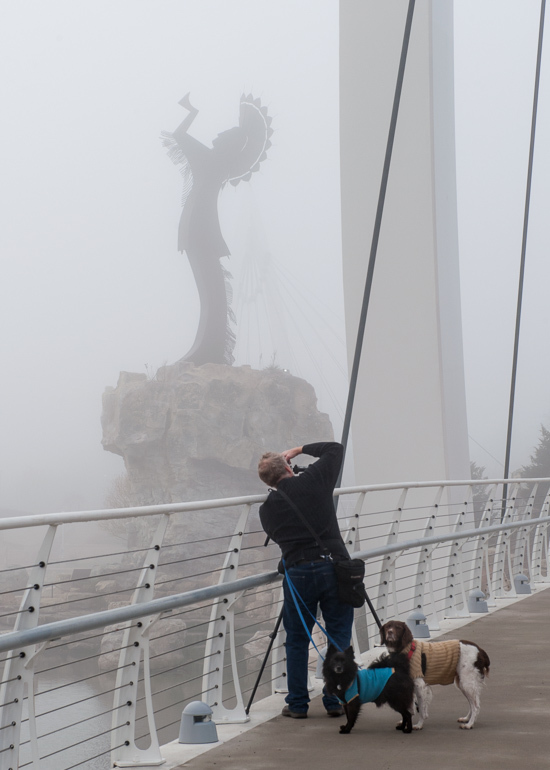 I ran across a fellow photographer who was in the same area, wrangling not only a tripod like me, but two dogs on leashes. My hat is off to him, I have enough trouble walking around with a tripod and my camera bag, without adding dogs to the mix. Well done sir. Blackbear Bosin’s The Keeper of the Plains, located at the confluence of the Big & Little Arkansas rivers in the heart of my home town, Wichita, Ks. The sky looked interesting this particular evening so I drove down to the Keeper and loitered about. After getting soaked by a brief rain shower, things started to improve. I have some images with more dramatic clouds, but I really liked the deep blue evening sky color in this one, contrasted with the artificially lit sculpture. There are a lot of power lines in the area, along with a couple of tall suspension bridge towers (interesting subject for photos as well) so it is sometimes a challenge to frame the sculpture to exclude all those things. One last image from the car show. A great old black Cadillac. It was at last years show also, I have many a shot of it’s hood ornament, of which I have posted a couple in the past. (The third photo down in my recent “hood ornament bonanza” post for example. It’s a big old hulking piece of American metal, full of interesting details and a boat load of character, beautifully restored and maintained. Just a couple of Ford related images from the Blacktop Nationals car show in Wichita a couple of weeks ago. I love the details on the old cars. I was going to say I love the details on the old Ford’s, but I see that in the mirror every day wink-wink. Seen at the Blacktop Nationals car show in Wichita last weekend. I believe this a Chevy, circa 1936. It was beautiful. I’m guessing this color was not among those offered by Chevrolet in the 1930’s ! 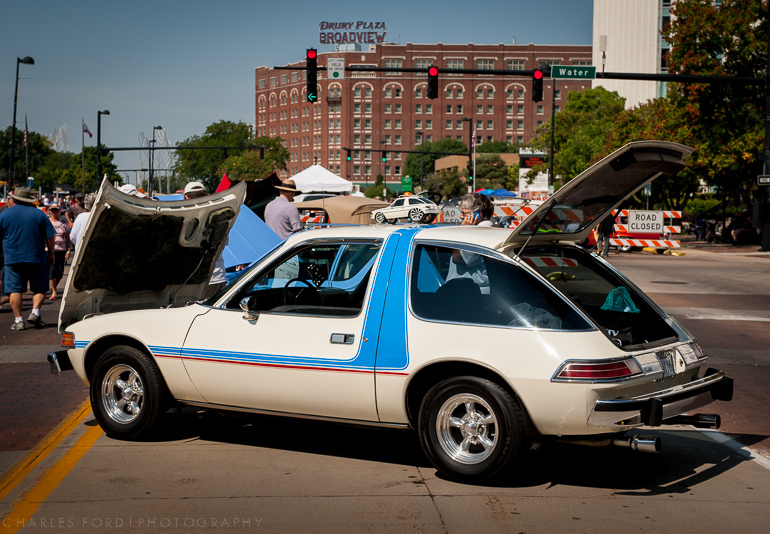 I just returned from two hours of exhausting walking around at the Blacktop Nationals car show in Wichita, Ks. I haven’t had time yet to do any real post processing work on the material, except for these two….this is for you Ken Bello! 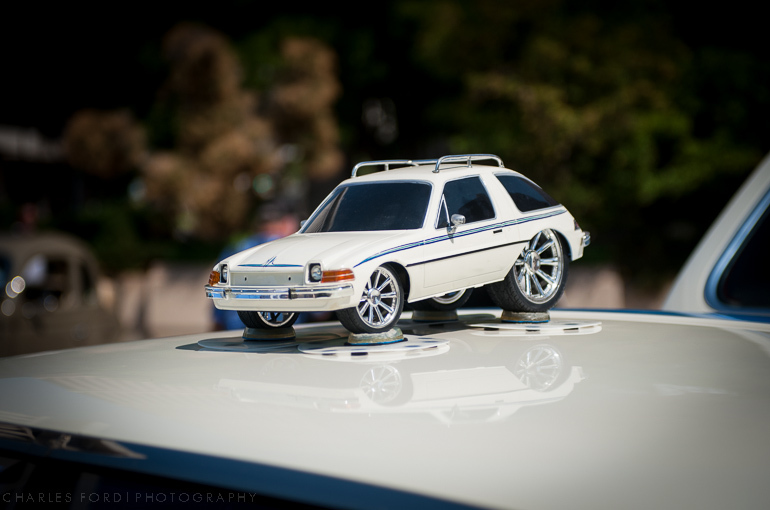 Knowing you are obsessed with the classic AMC Pacer, one of the great misunderstood genius car designs of modern times, when I saw this, I immediately knew I had to share. Oh yeah, this is what the Pacer on the top was sitting on….. This is a scene from one of the less attractive sides of Wichita. 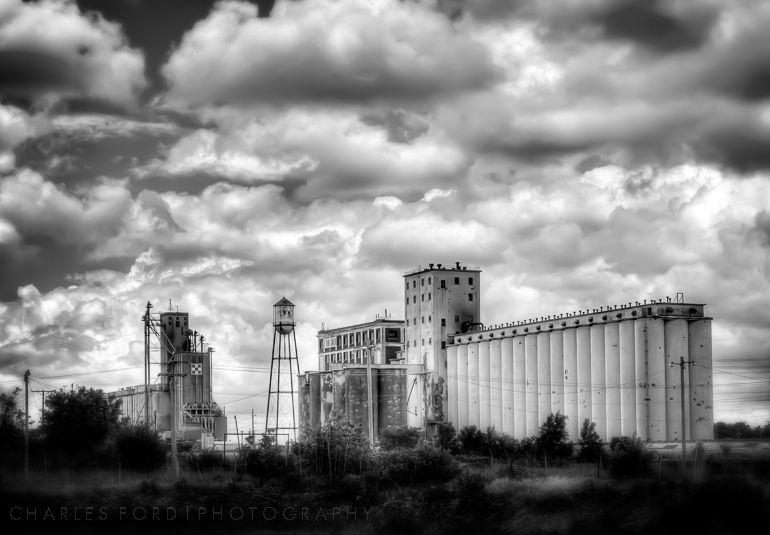 Grain elevators are a common sight here, as they are all across the plains. 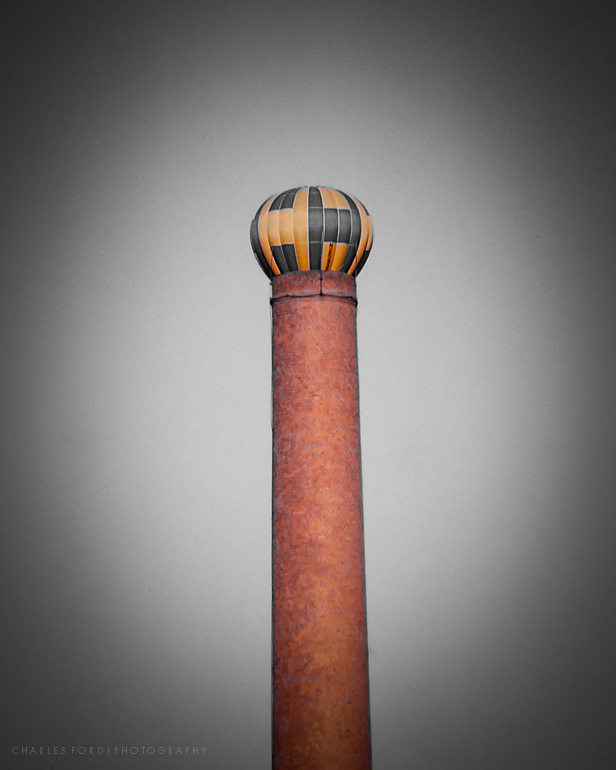 I also seem to be obsessed with old water towers that look like rockets on the launch pad. This particular one has been bedeviling me for years, this is the first time I actually stopped to photograph it. The clouds were interesting on this day, so I stopped for a grand total of about 90 seconds to grab a few frames. (This involved parking at the side of a busy street in not the greatest area of town. ) It’s an HDR, monochrome conversion with a little extra post processing. A blast from the past. Back in the 1980’s I was in a local park when some hot air balloons became visible, drifting slowly across Wichita. I saw one of them was going to line up with the giant smoke stack at North High School, which was just across the river from me at the time. I waited until the right moment and took this exposure. There it resided in it’s boring slide mount for probably close to 30 years, until last night it met up with my new Wolverine Slide Converter gadget. Thanks to Ken Bello for making me aware of this device. I’ve started converting a few old slides, trying to learn the quirks of the Wolverine. (By the way, that was almost the title of this post…”The Quirks Of The Wolverine”. ) This particular image has also had some Lightroom work done on it to make it a little more graphically interesting to my eye. I look forward to finding other old gems.